The cars may not roar to life at Bristol Motor Speedway for nearly a month, but that didn't keep Austin Dillon, this year's Daytona 500 winner, and a host of other competitors from gathering here at Bass Pro Shops for a fan/media kickoff program Wednesday evening. Dillon, driver of the No. 3 Chevrolet Camaro ZL1 for Richard Childress Racing as well as a former NASCAR XFINITY Series winner at BMS, was joined by his brother, fellow Monster Energy NASCAR Cup Series driver Ty Dillon, their father Mike Dillon, the Senior Vice President of Business Operations for RCR, and the organization's founder, Richard Childress. Also taking part in the evening's festivities were NHRA competitors Tony Schumacher, Leah Pritchett and Matt Hagan of Don Schumacher Racing, as well defending Bristol Pro Stock winner Alex Laughlin. The annual Food City 500 race weekend, which includes the Fitzgerald Glider Kits 300 XFINITY Series race, Bush's Beans Pole Day and the Zombie Auto 150 NASCAR Modified race, is scheduled for April 13-15. The newly-named Fitzgerald USA NHRA Thunder Valley Nationals are slated for June 15-17 at Bristol Dragway. There was a brief archery competition to kick off Wednesday's program - Austin Dillon confessed Hagan "got me when he put one in the white". The evening also featured impromptu bowling battles that included co-emcee Jamie Little of FOX Sports where Austin bowled a 199 with an impressive five strikes in a row. 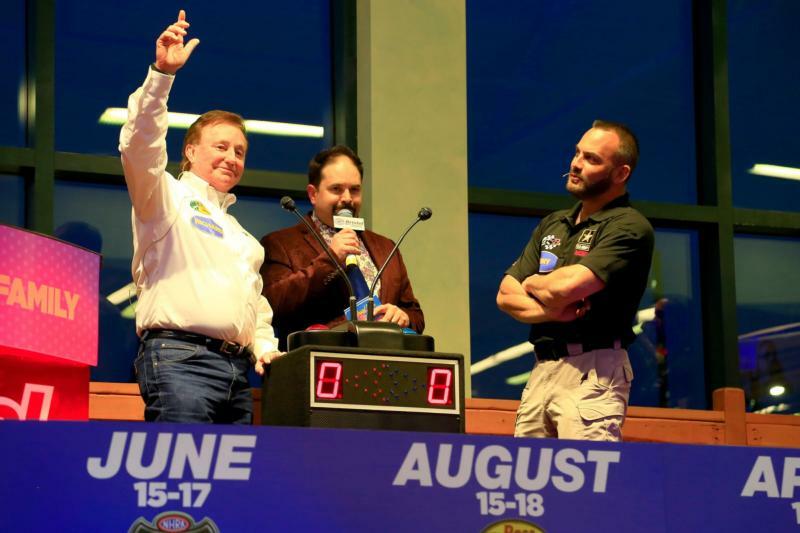 An autograph session with the NHRA competitors and an evening-ending "Feuding Families Bristol Edition," a takeoff of the popular Family Feud game show that pitted the two racing groups against one another. "Feuding Families? You should see us (at the shop) during the week sometimes," Childress said, laughing at the program's title. In looking ahead to this season's racing programs at Bristol, competitors were quick to sing the praises of both the round track and drag strip, which are considered among the most action-packed and memorable in racing. "You feel like a gladiator racing out there in front of a lot of people, beating and banging, (racing) side by side. You never can catch a breath the whole race. Physically it's demanding and mentally it's taxing." One last ?? before we leave! Ty Dillon made his Bristol Cup debut in 2016, driving in relief for three-time series champ Tony Stewart. Now the driver of the No. 13 Chevrolet for Germain Racing, Dillon said Bristol "is just the coolest place to go." "If you don't get chills when you walk in at Bristol and look up at the stands, even when there are no cars on the track, I don't think you can feel much in your life" he said. The feeling is no less intense for those competing at the legendary dragstrip. Schumacher's a five-time Bristol winner, but he says that's not why the track holds a special place in his heart. Looking at the track from the top end, taking in the grandstands and the surrounding hillsides, he said, "is one of the views throughout the year that makes it awesome for me to remember I get to do this every weekend. "Every now and then, you have to remember why you do it. It's not about the paycheck, it's about the love of the game. You hear the guy hit the throttle, you hear the echo (off the mountainside); this is an awesome place to race." Hagan, meanwhile, calls Bristol his home track and with good reason - the two-time NHRA Funny Car champion (2011, '14) resides in Christiansburg, Va. Among his 26 career victories is a 2015 win at Thunder Valley. "I got more choked up winning Bristol than any race I've ever won," said Hagan, and that includes winning the prestigious U.S. Nationals in Indianapolis. "This place is huge (to me). … It was a bigger win for me to win Bristol than to win Indy because I'm two hours down the road, my family is here, everybody I grew up with comes out to support you. … To get to celebrate with my dad, my kids are usually there and it's Father's Day weekend. That's what it's all about." Several hundred fans turned out for the evening's program, with BMS General Manager Jerry Caldwell noting that track efforts are "always focused on the fans and you will certainly see that this year." Much of that effort, he said, has been put on fan enhancement, ranging from improved cell service in and around the facilities to increased concession areas and other amenities. "And a lot of this," he told the audience, "came from fan feedback."